Started working in shop running saws, cutting steel, processing orders. Transferred to administration, quoting and processing orders for customers. Advanced to sales department and traveled throughout United States and became Vice President of Sales. As President of this family organization, he studied Metallurgy at a local college. 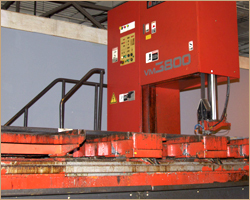 His knowledge and experience in the Specialty Steel and Forging Industry resulted in the purchase of a forging operation consisting of a 2000 ton forging press, twin 5 ton manipulators, and all heating and annealing equipment. By request of CH Industries he traveled to Mexico and consulted on forging operations. He traveled to Bolzano, Italy and purchased stainless steel from Bolzano Steel. Sheffield Forgemaster of Sheffield, England provided forged bar stock. Rolled plate products were obtained from Spartan UK, also of England. Mr. Crouse’s background includes basic knowledge of metallurgy, metal processing, marketing, accounting and advertising when applied to the specialty steel and forging industry. Known throughout the industry as “JR”, he began his career in the specialty steel and forging industry as a shop employee. This experience allowed him an opportunity to learn the basic processing procedures to meet the customer’s requirements. The time JR applied to this beginning allowed him to understand the importance of quality control, grinding, sawing, drilling and other processes required in his new business adventure. JR entered the administrative sector and completely engaged himself into the many areas required in marketing, sales management, quality control procedures and cost controls. Following in his father’s footsteps, he familiarized himself to the complex methods of specialty steel and forging production. Using computer technology, JR helped develop advertising material and marketing systems that allowed his company to sell their products throughout the United States, Canada and Mexico.